The Freedom of Information Act is a powerful tool of democracy that let's common citizens delve deeply into the inner workings of our often labyrinth government. It also allows citizens to ask the government to reveal the recipe behind the President's White House Honey Ale. At least that what one redditor is hoping will happen. 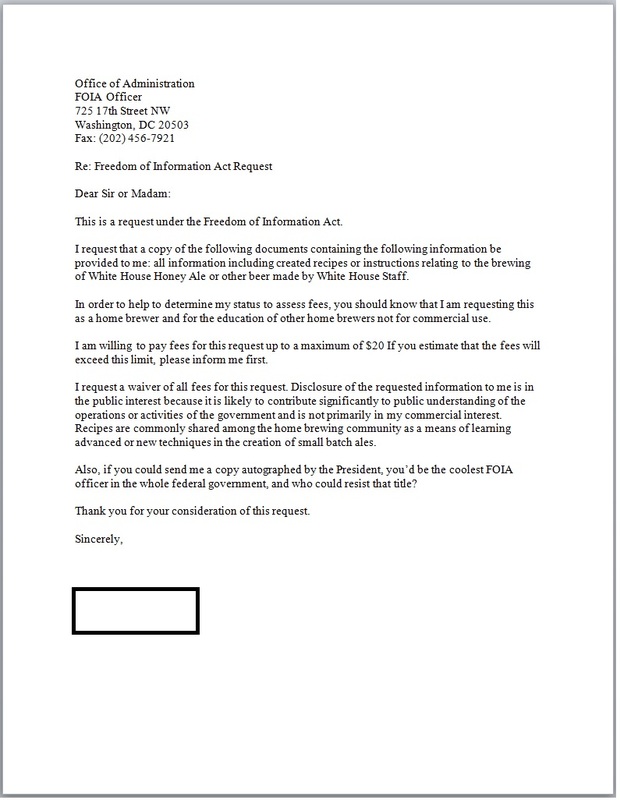 A user of the popular homebrewing subforum said he submitted a FOIA to the White House requesting, "All information including created recipes or instructions to the brewing of White House Honey Ale..." He justified his request as being in the public interest as it will likely help disseminate a better understanding of brewing techniques and practices. The redditor that submitted the request admits that there are a number of pitfalls regarding his FOIA. Chief among them is that it's possible that there are no formal documents to request. If the White House chefs that brew the beer do so from rough notes or memory then there's nothing they can do. It's also worth noting that the FOIA doesn't specifically compel the Executive Branch to respond to such requests although they normally do. Largely he's hoping that his polite and humorous request will receive a response because it gives some FOIA officer, "An assignment that's more interesting then their actual work." While specifics are sketchy it sounds as though the White House Honey Ale is brewed from the White House's own bee hives on the South Lawn. White House press secretary Jay Carney described the beer as "superb" and "quite refreshing." However, he plead ignorance to who the President's brewmaster is and he revealed the existence of a second, darker, White House Beer. President Obama certainly enjoys a cold brew, so much so that it has become a meme. It's been reported that, after taking office, he purchased beer making equipment with his own funds and instructed the White House chefs to begin brewing beer, making him the first president to do so in White House history. Obama also famously shared one of those beers with Medal of Honor recipient Dakota Meyer.